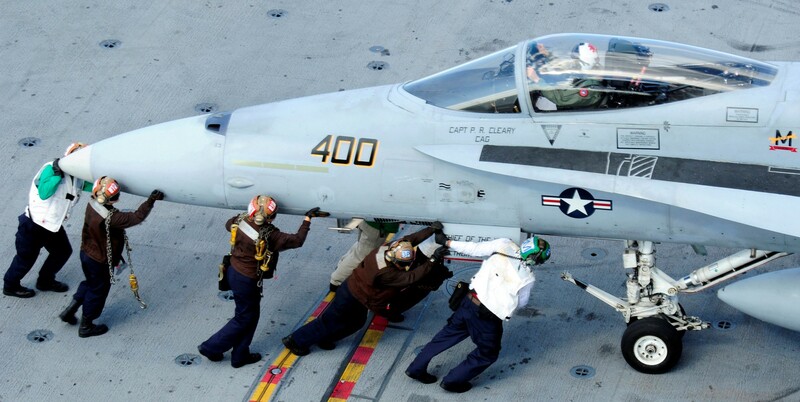 On 1 Februray 1968, the Golden Warriors were established as Attack Squadron 87, the first to fly the A-7B Corsair II from NAS Cecil Field, Florida. 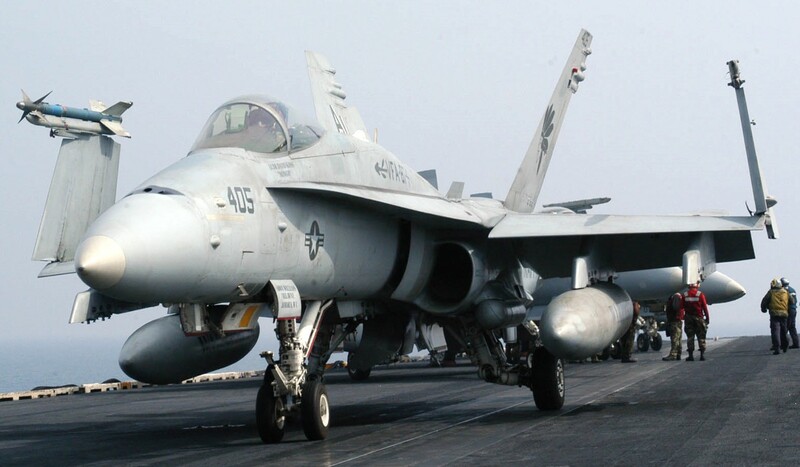 The first combat mission flown by the squadron was on 4 March 1969 from the USS Ticonderoga (CVA 14), striking enemy targets in South Vietnam. 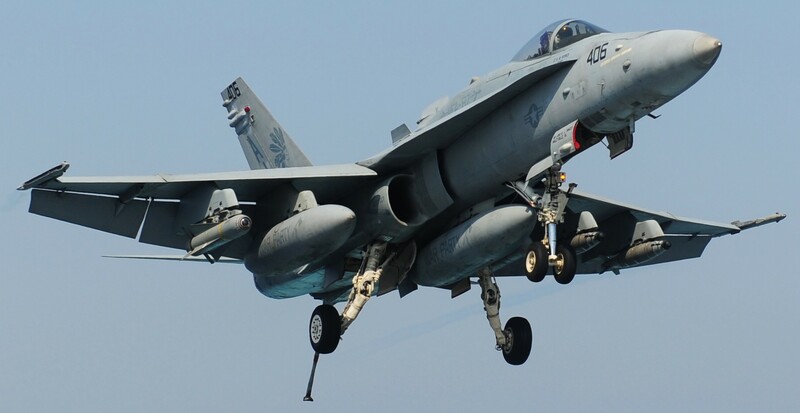 In August 1970, VA-87 joined CVW 6 and made twelve deployments aboard USS Franklin D. Roosevelt (CV 42), USS America (CV 66) and USS Independence (CV 62). 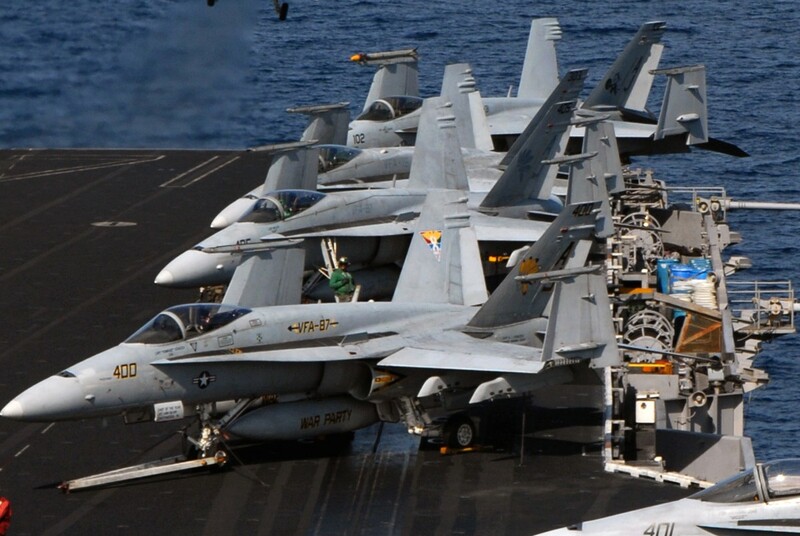 In the fall of 1973, the Golden Warriors embarked aboard USS Franklin D. Roosevelt (CV-42) to protect U.S. interests during the Arab-Israeli War. 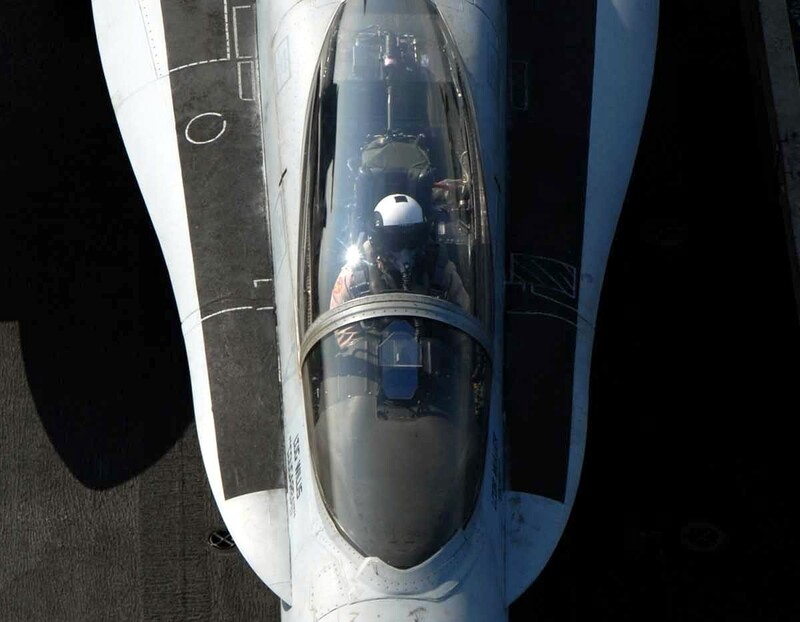 Transitioning to the improved A-7E Corsair II, the squadron returned in October 1975 to the Middle East following the assassination of the American Ambassador to Lebanon and assisted in the evacuation of U.S. citizens. 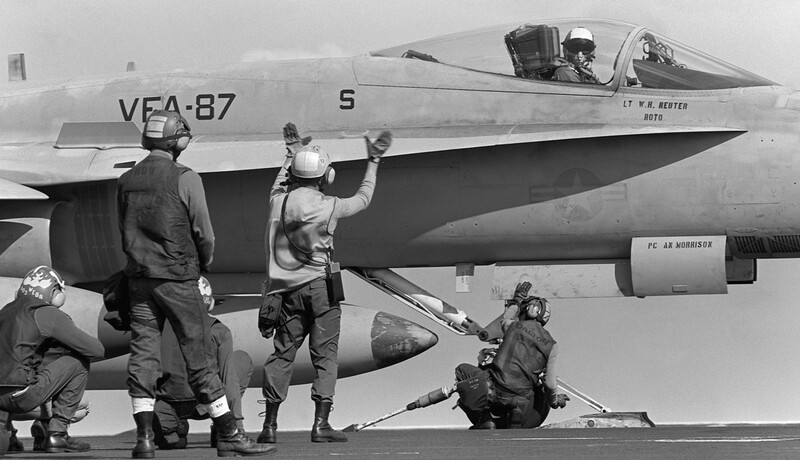 During the Iranian hostage crises and the Israeli-Syrian disputes of 1981, VA-87 deployed to the region for 195 days. 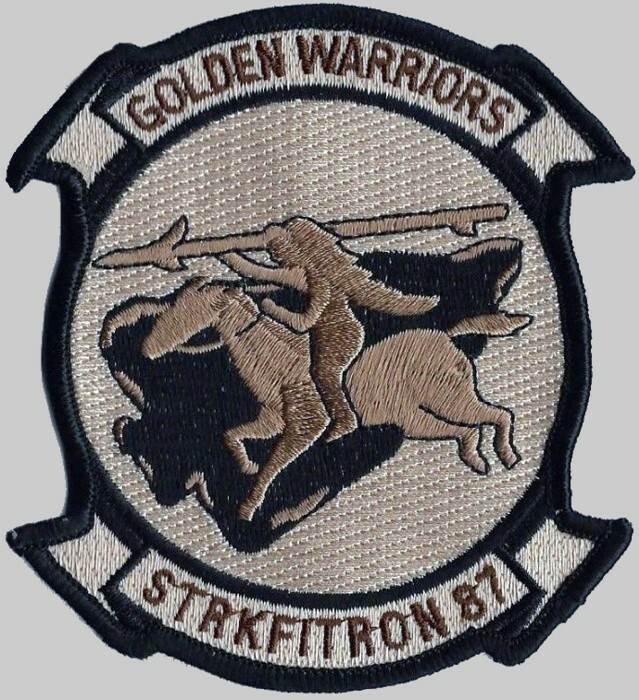 One year later the Golden Warriors were back in the fray, supporting U.S. peacekeeping operations in Lebanon for 172 days. 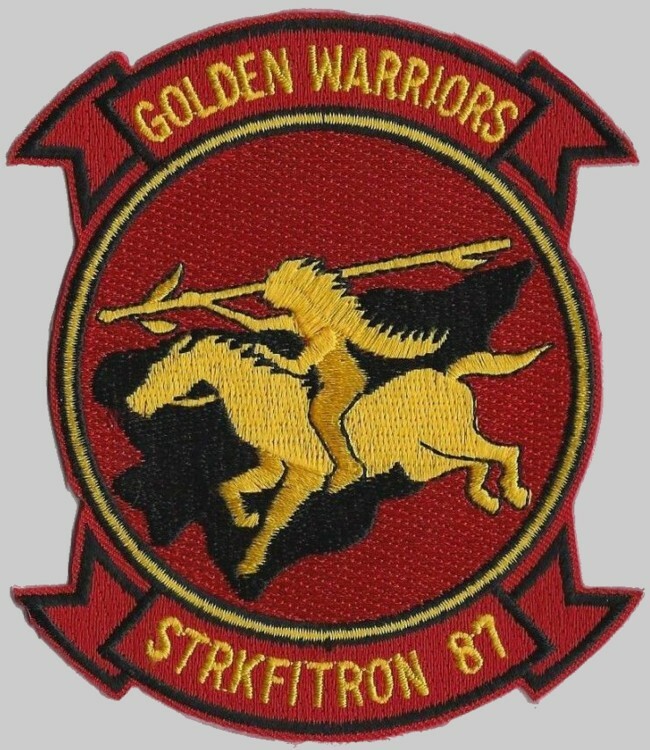 In October 1983, the Golden Warriors participated in Operation URGENT FURY, protecting American citizens from political strife in Grenada. 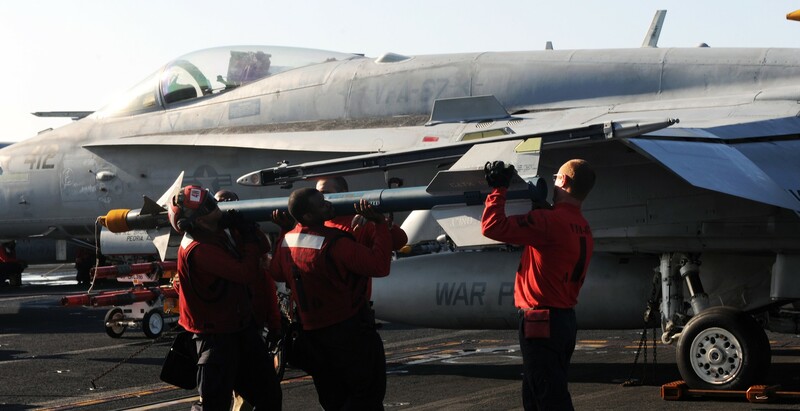 During the same deployment, VA-87 participated in strikes against Syria in ongoing United Nations efforts to stabilize the Middle East. 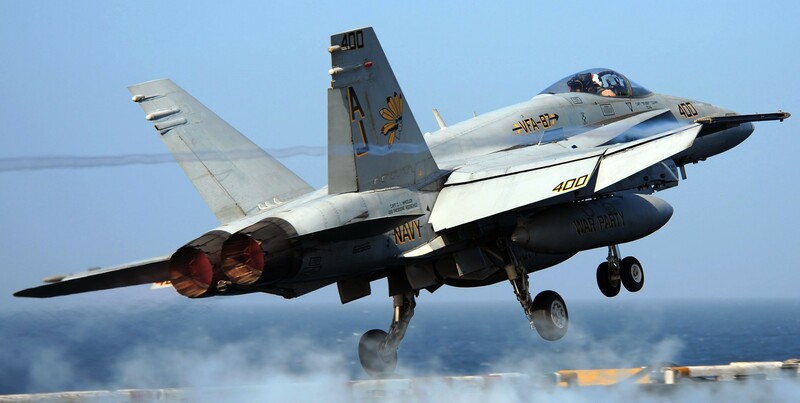 The Golden Warriors began a new era on 24 October 1986 when the venerable Corsair was retired and the squadron was designated Strike Fighter Squadron 87 with the new McDonnell Douglas FA-18A Hornet, the first Naval aircraft designed from conception as a strike fighter. 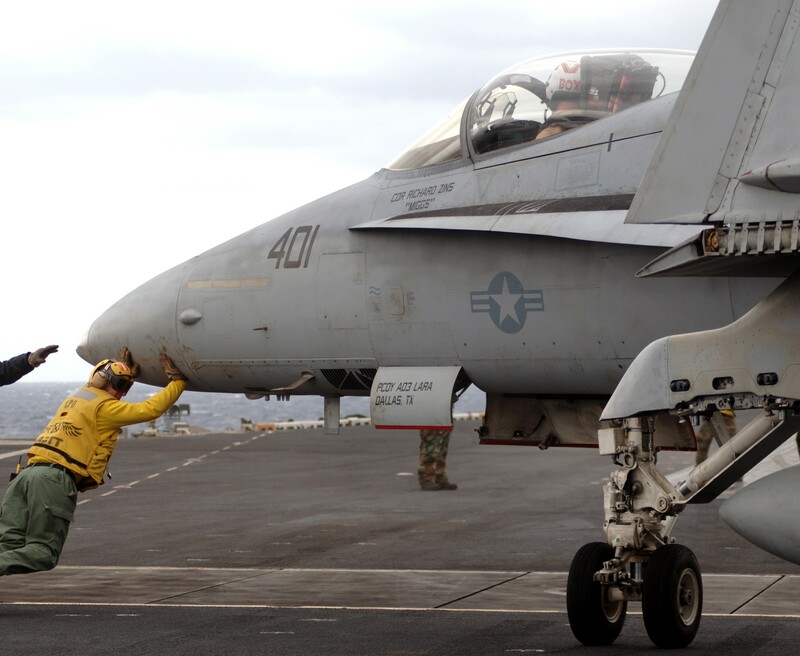 After a temporary assignment with Carrier Air Wing ONE, the Golden Warriors embarked aboard USS Theodore Roosevelt (CVN 71) while joining the world's most powerful air wing, Carrier Air Wing EIGHT (CVW-8), in December 1988. 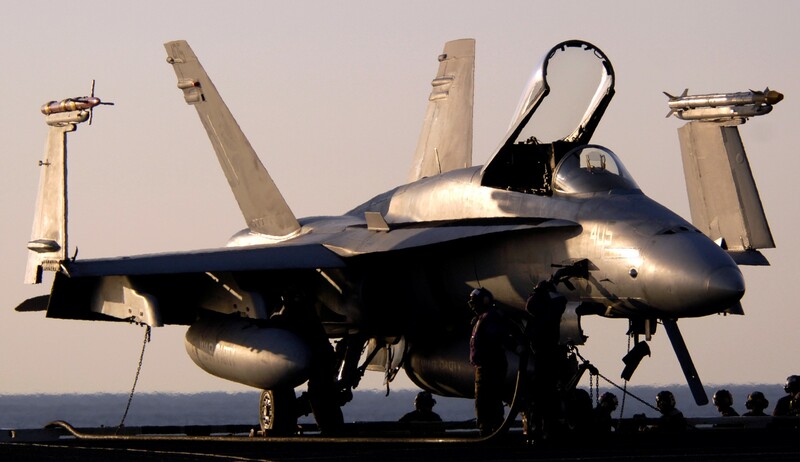 Then, on 28 December 1990, VFA-87 deployed for Operation DESERT STORM, flying 629 sorties over 43 days of intense combat to liberate Kuwait. 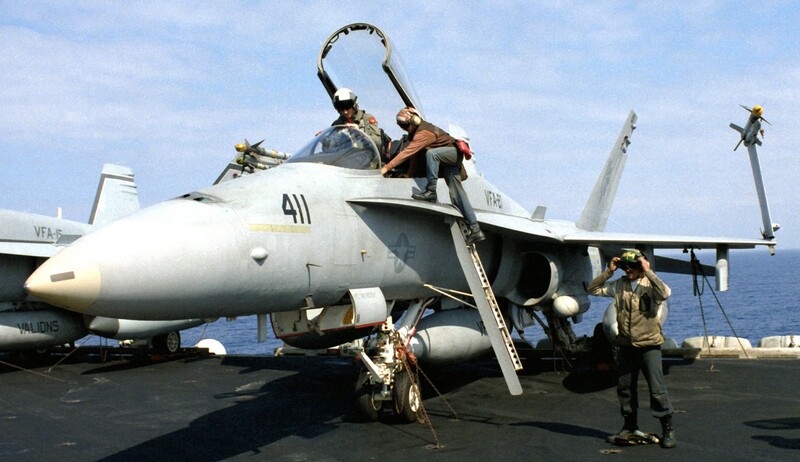 From March to September 1993, the Golden Warriors supported Operations DENY FLIGHT, PROVIDE COMFORT, and SOUTHERN WATCH (OSW) with the newer FA-18C Hornet. 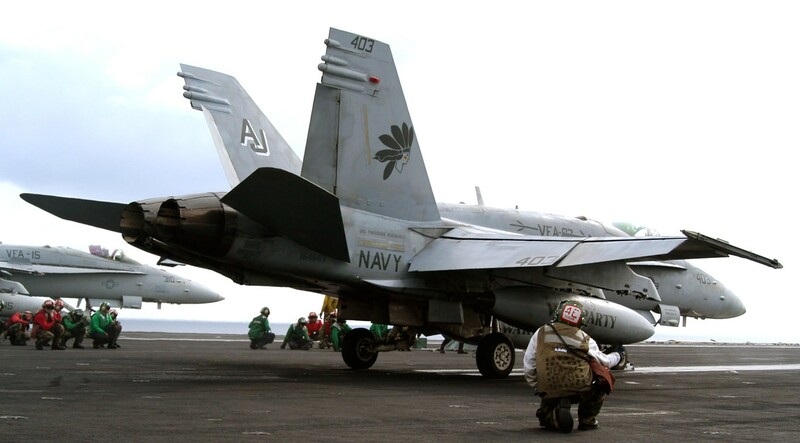 USS Theodore Roosevelt (CVN 71) and VFA-87 returned to the Arabian Gulf in March of 1995 for OSW followed by combat sorties over Yugoslavia. 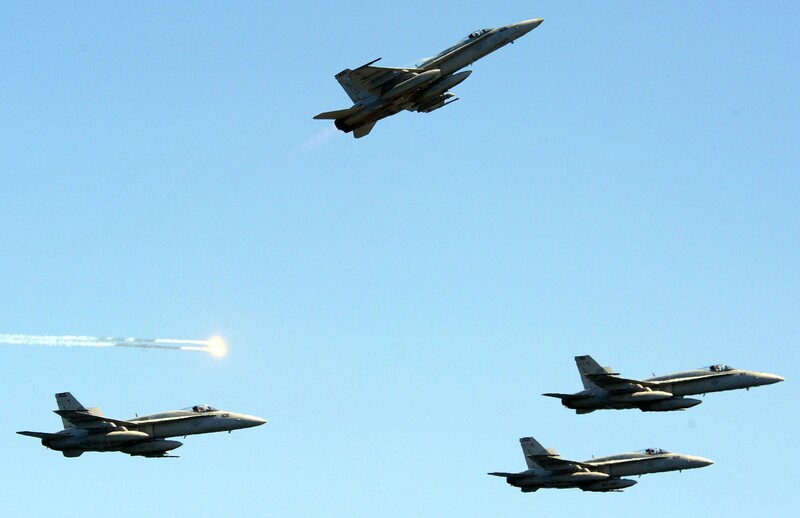 On 30 August 1995, Golden Warrior jets were the first to strike Bosnian/Serbian targets during Opertation DELIBERATE FORCE. 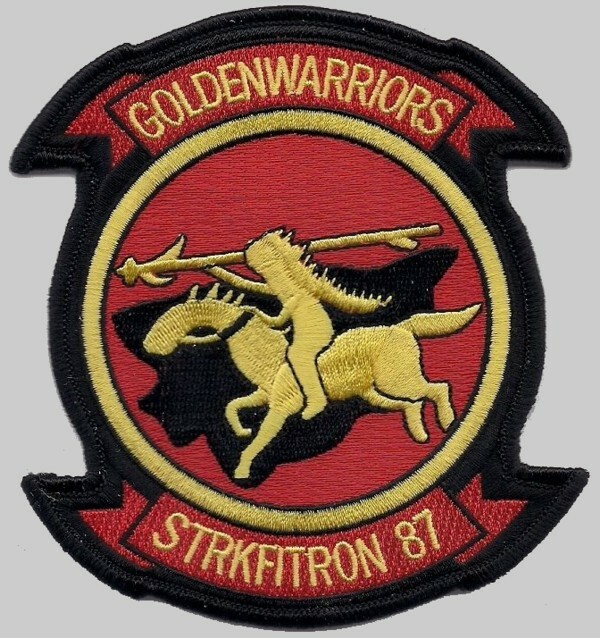 The Golden Warriors then participated in Operation DELIBERATE GUARD during a summer deployment with USS John F. Kennedy (CV 67). 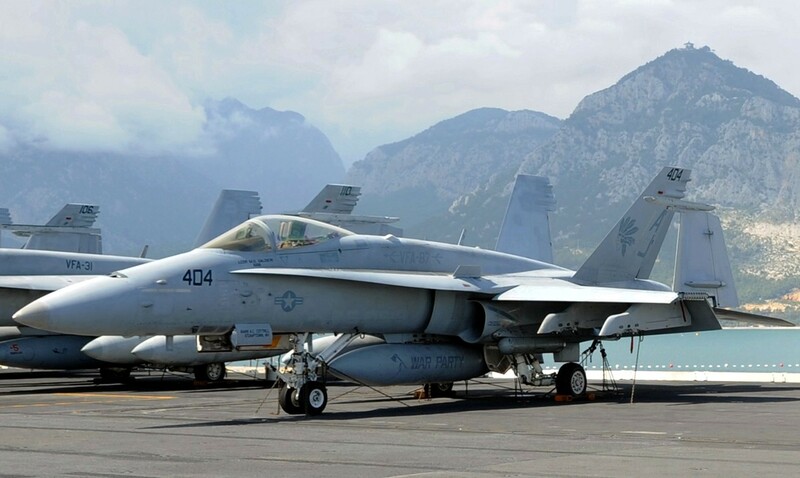 They also returned to the familiar Arabian Gulf for OSW before coming home in October of 1997 to Cecil Field for the final time in the squadron's history. 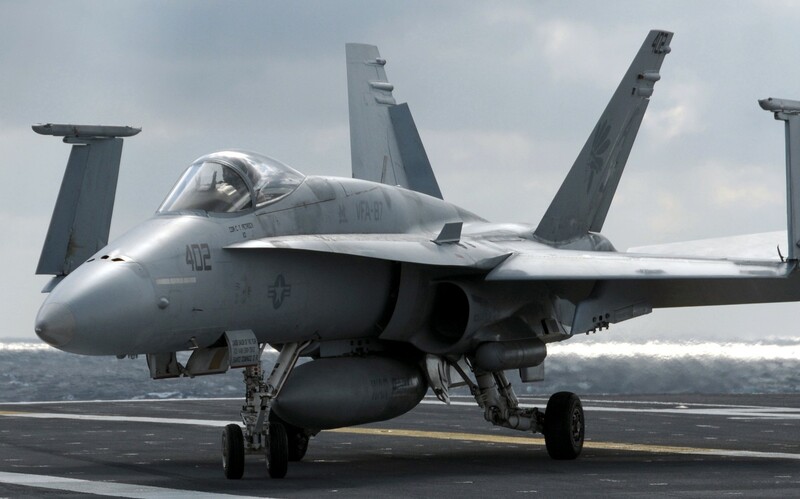 VFA-87 made history again by participating in combat operations in two different theaters during a single deployment, operating from USS Theodore Roosevelt (CVN 71). 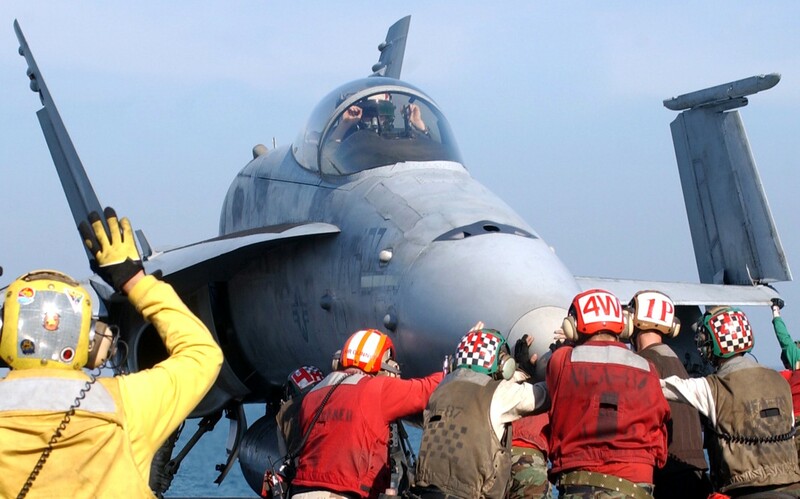 While enroute to the Arabian Gulf in April 1999, crisis erupted in the former Yugoslavian republic of Kosovo, prompting the largest aerial bombing campaign since the Vietnam War. 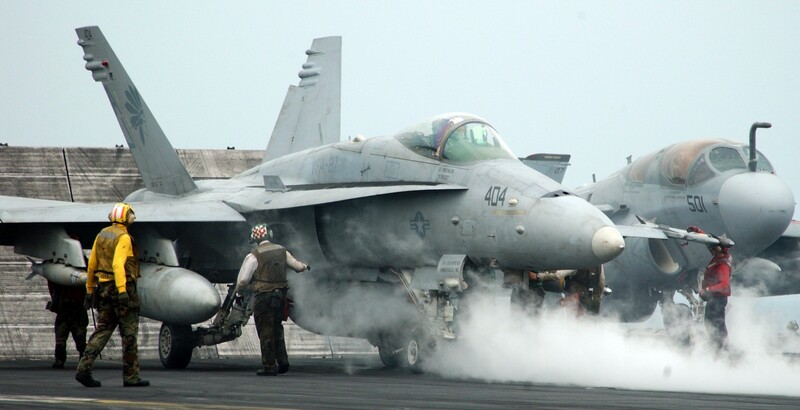 In just 68 days, "War Party" FA-18s dropped 430,000 pounds of ordnance and flew 595 combat missions during Operation ALLIED FORCE, contributing to a NATO victory and expelling Serbian oppressors from the war-torn province of Kosovo. 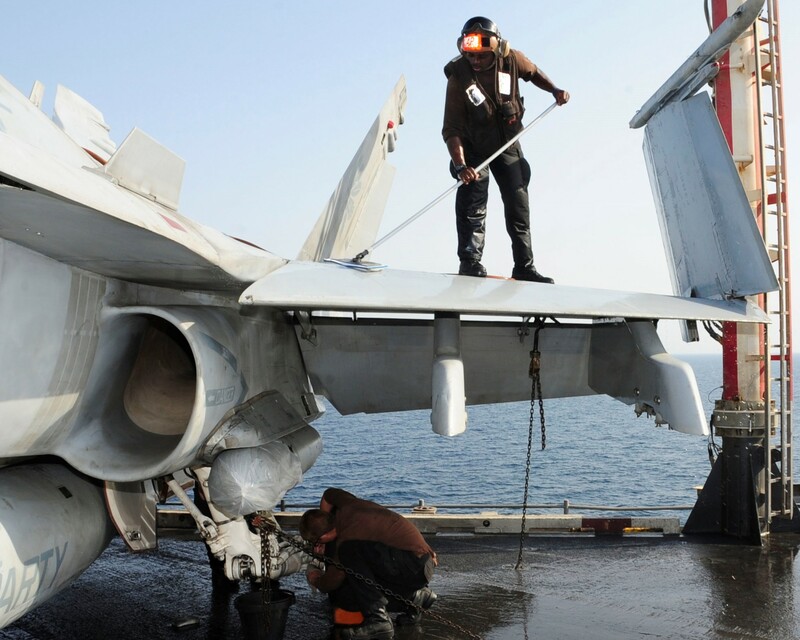 In July, VFA-87 returned to the Arabian Gulf and flew 176 combat missions in support of Operation SOUTHERN WATCH. 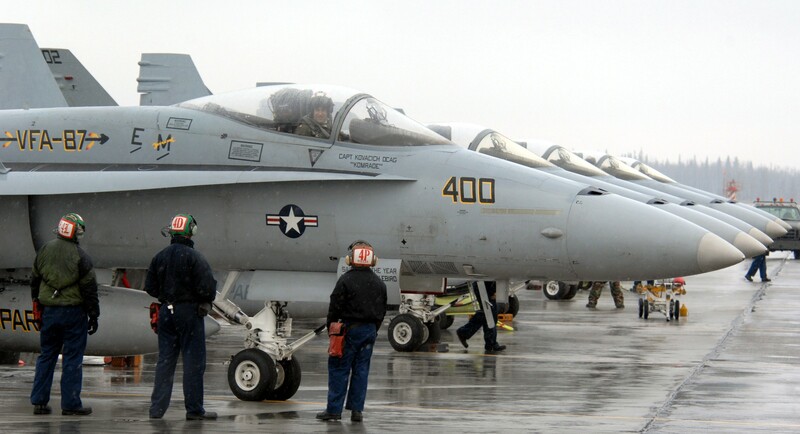 Following this deployment, the Golden Warriors returned to their first new home in over thirty years, NAS Oceana in Virginia Beach, Virginia. 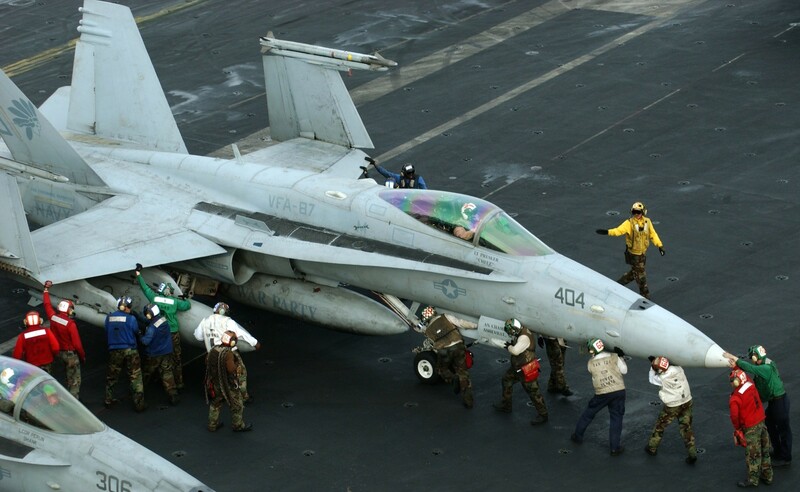 The Golden Warriors left Oceana in April 2001 for the Mediterranean aboard USS Enterprise (CVN 65), the world's first nuclear aircraft carrier. 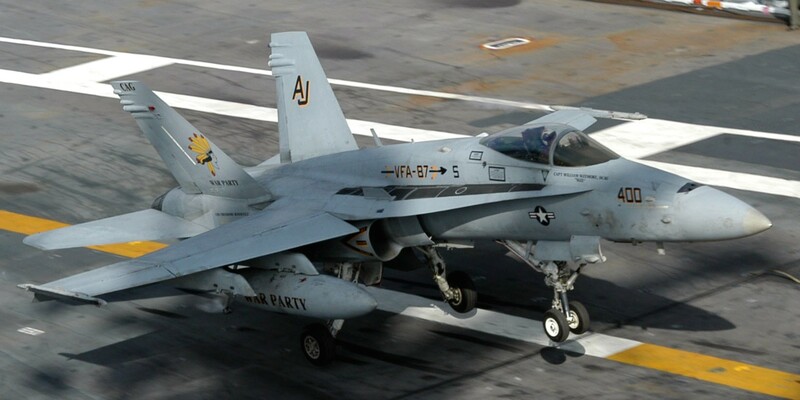 VFA-87 left the Arabian Gulf after six weeks of OSW support, beginning the long transit back to Virginia when the September 11th terrorist attacks occurred. 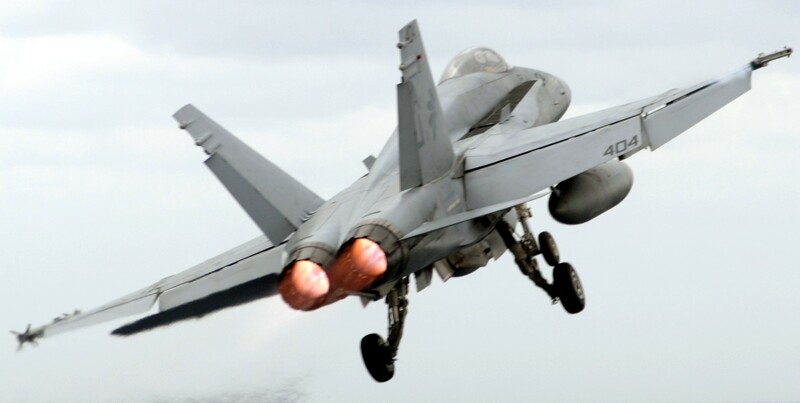 Following this tragedy the Golden Warriors again answered the call when the United States Navy responded with a massive offensive against the Taliban and Al Qaida forces in Afghanistan marking the birth of a war against global terrorism in Operation ENDURING FREEDOM. 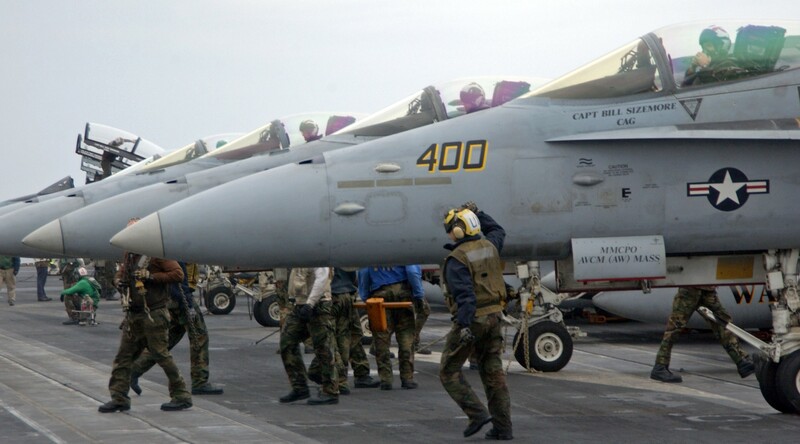 While preparing for a Spring 2003 deployment to the Mediterranean, escalating tensions in the Middle East again brought the "War Party" to action as a member of the CVW-8 team, embarked in USS Theodore Roosevelt (CVN 71). 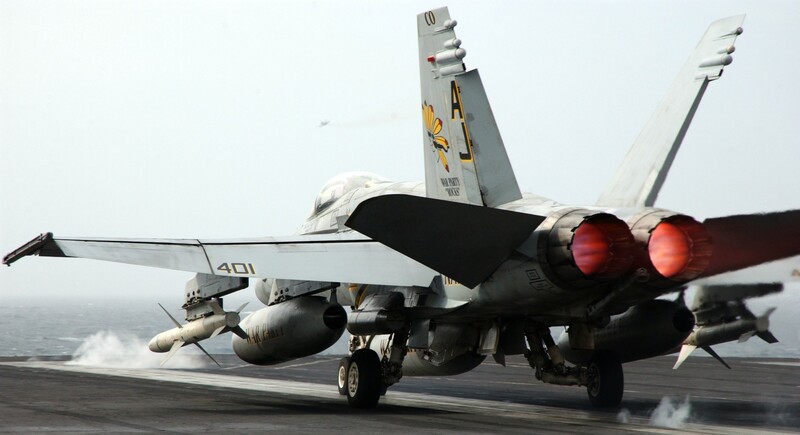 Deploying to the eastern Mediterranean five months ahead of schedule, the Golden Warriors again made history by contributing to the removal of Saddam Hussein's regime in Iraq in Operation IRAQI FREEDOM. 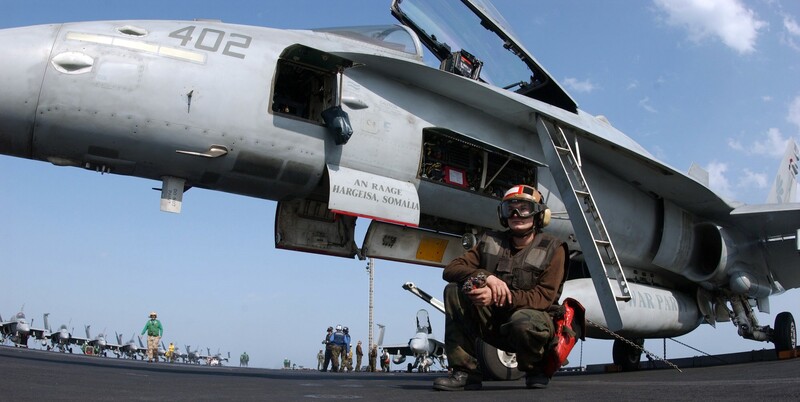 In September 2005 the "War Party" deployed aboard USS Theodore Roosevelt (CVN 71) in support of Operation IRAQI FREEDOM for a second time, ensuring a successful constitutional referendum and Iraq's first free elections. 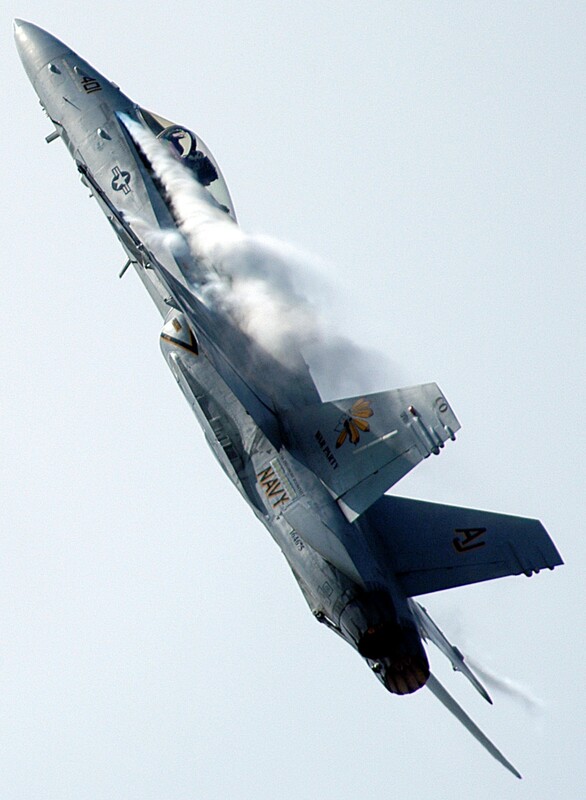 The Golden Warriors were awarded their first ever Battle Efficiency Award in 2005 and repeated with 2006 Battle "E" Award. 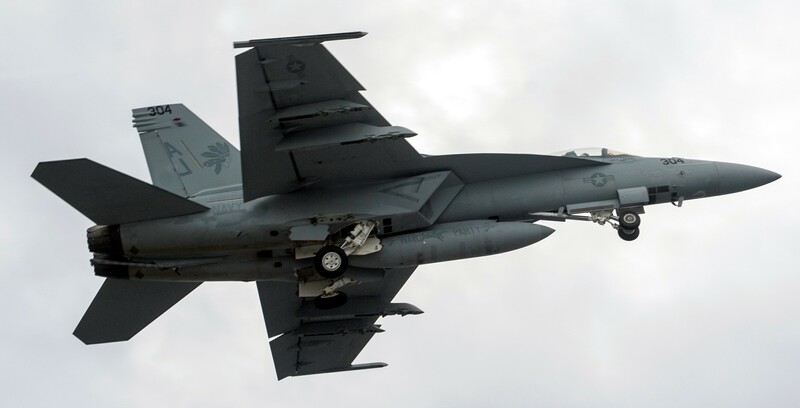 Strike Fighter Squadron 87 completed an unprecedented and highly successful transition from the heavily utilized, combat proven FA-18C back to the other older but less fatigued FA-18A+ Hornet in late 2006. 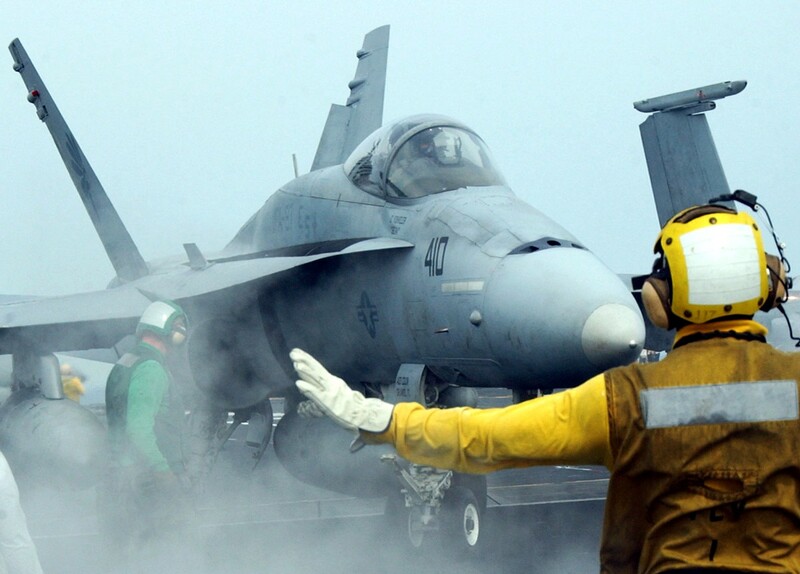 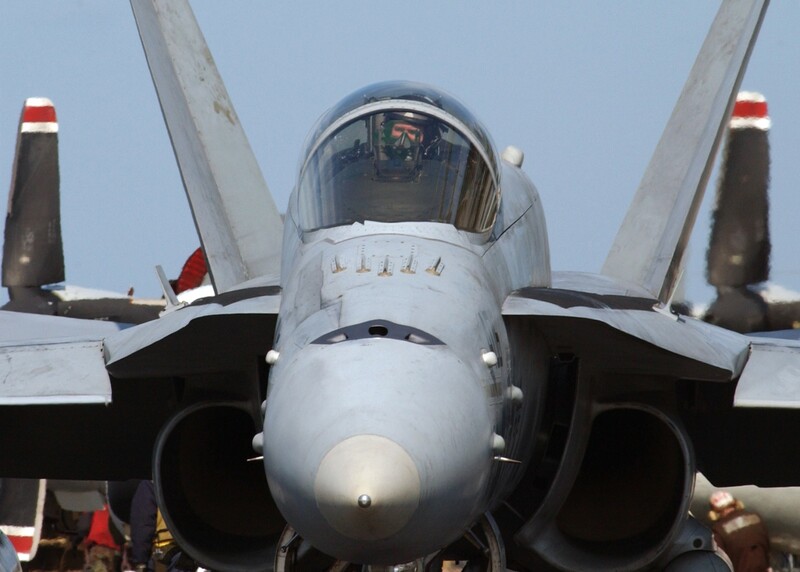 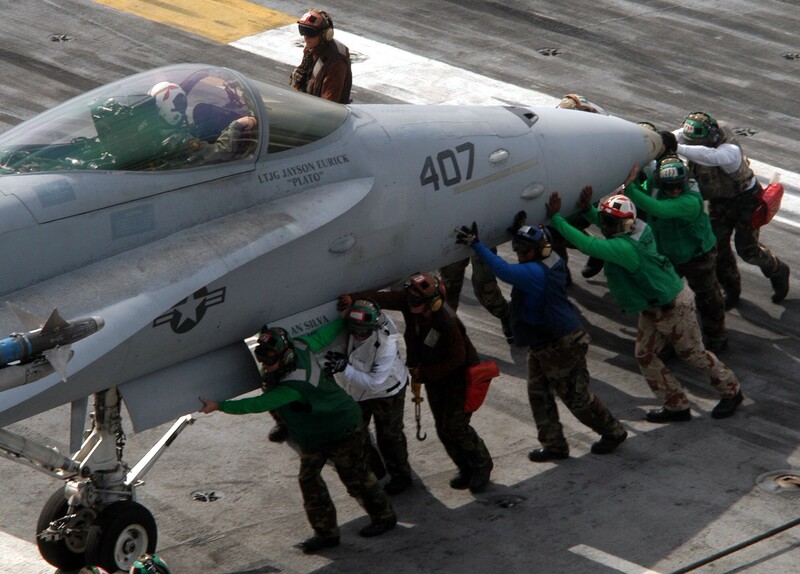 Throughout 2007 and the beginning of 2008, VFA-87 participated in various detachments and work-up exercises in preparation for their next deployment. 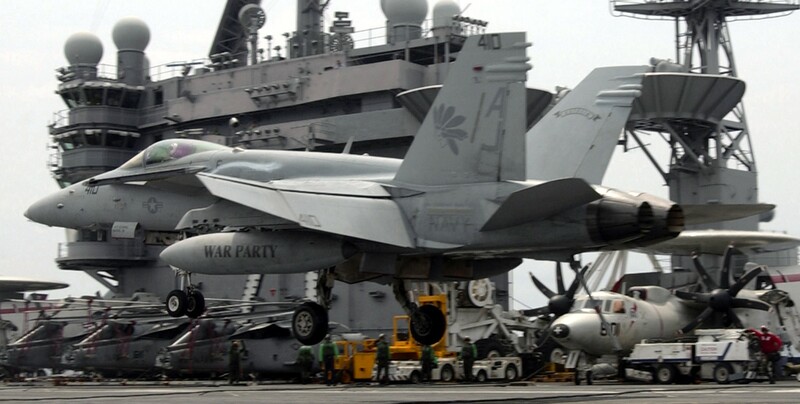 The "War Party" deployed with the USS Theodore Roosevelt (CVN 71) in support of Operation ENDURING FREEDOM in September, returning home to NAS Oceana in April 2009. 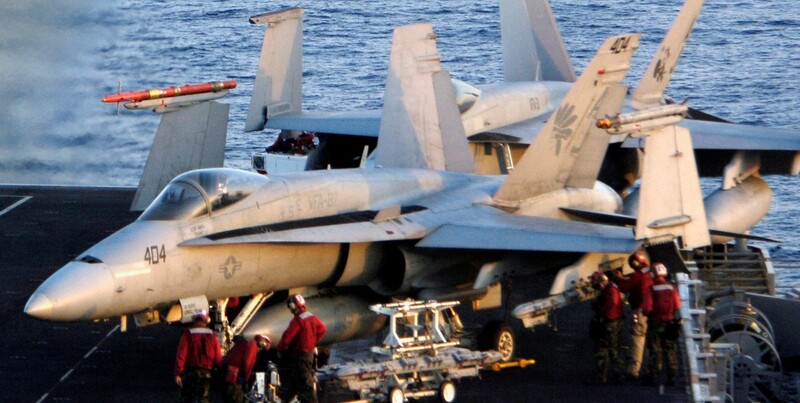 2010 was a year of significant accomplishments for the "War Party." 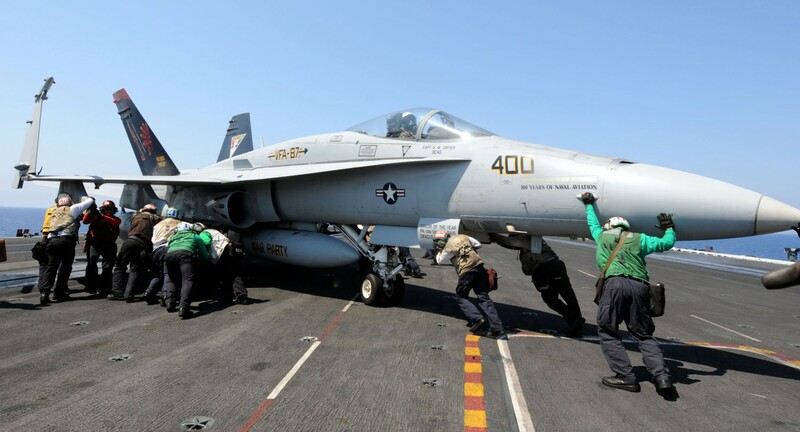 VFA-87 participated in three embarked periods in preparation for the 2011 maiden deployment of the USS George H. W. Bush (CVN 77), including a deck certification, Independent Steaming Exercise (ISE), and Tailored Ship’s Training Assessment (TSTA). 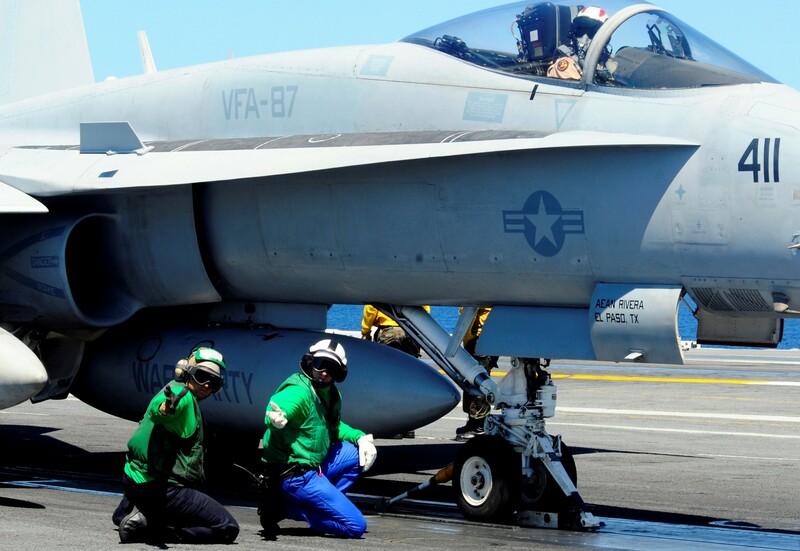 VFA-87 deployed aboard CVN 77 from May to December 2011 in support of Operation ENDURING FREEDOM, supporting US and coalition forces in Afghanistan. 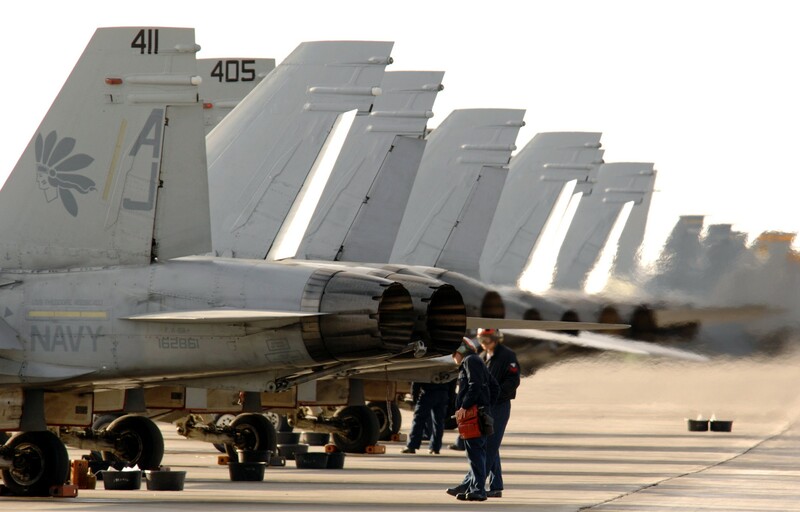 In 2012, the Golden Warriors accepted ten FA-18C aircraft and began grooming them for a tenacious work-up period and future deployment. 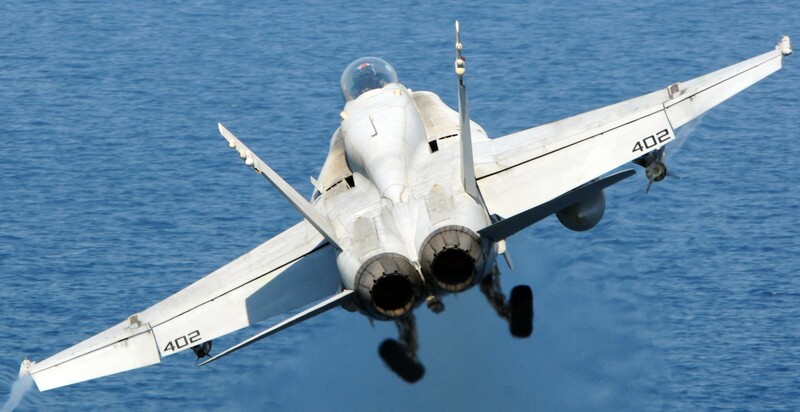 The ten newly acquired aircraft had not dropped air to surface ordnance or been to sea in over five years. 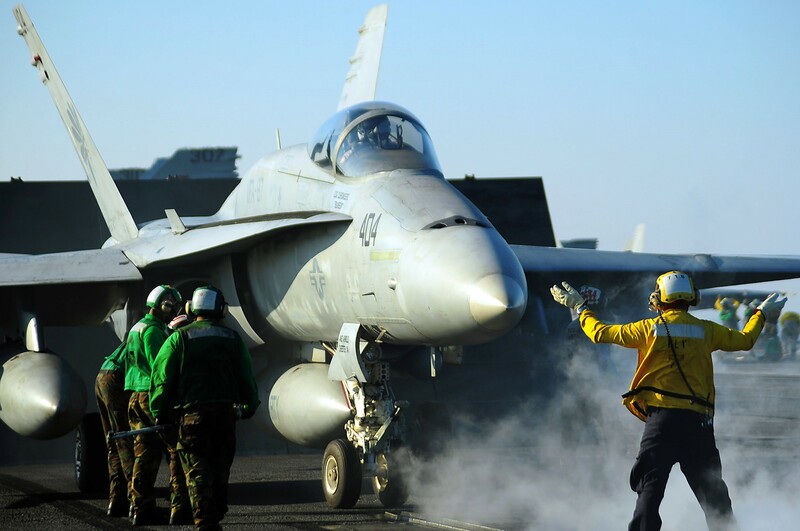 The end of 2012 brought the beginning of another work-up period and in 2013, VFA-87 completed six detachments around the country in preparation for deployment. 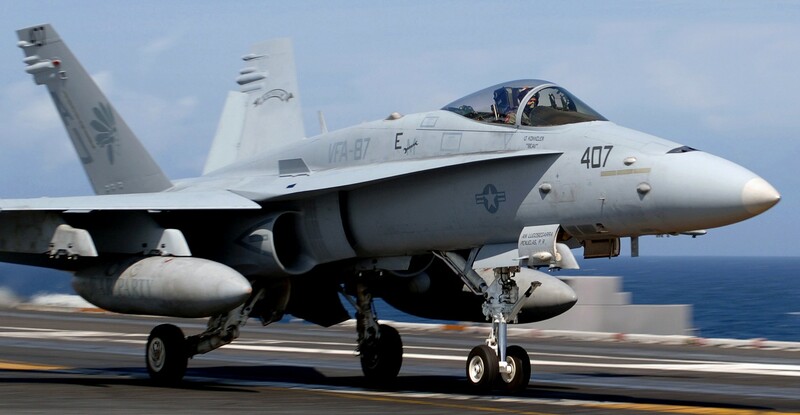 In February 2014, VFA-87 again embarked aboard CVN 77 and is currently deployed to the Fifth Fleet Area of Responsibility in support of National Command Authority tasking.